A few months ago, I had an "Instagram cull." If you're unfamiliar with the term, it means you have to cut the dead weight of who you follow. You wave goodbye to the ones you no longer need to stalk, hit the unfollow button on people who make you feel inadequate for never venturing further than your local postcode and mute the people you can't part with just yet but also can't handle seeing post another OOTD or deep-and-meaningful quote on your feed. During said cull, I noticed something: All my favourite Instagrammers who were allowed to stay had the exact same haircut that was short in length and always accompanied by a fringe. I've always had a thing for the archetypal French-girl bob-and-fringe combination, mostly due to the fact I too had this exact Amélie-inspired cut as a little girl. My mother would cut my little blonde bob with kitchen scissors and give me a mini fringe every single summer before we headed to the South of France on holiday. It's a look I've dabbled with time and time again ever since. But I didn't realise just how obsessed I was with this style until 2019. Anita Rice, founder of London-based hair salons Ralph and Rice and Buller and Rice, told me that this style of haircut can be quite versatile depending on your face shape. She recommends speaking to your hairdresser about your desired length of bob. Someone with a more pear-shaped face should opt for a longer bob and someone with a heart-shaped face could brave something cut above the jaw. So which Instagram ladies and celebs are serving up the best bob hairstyles, complete with the all-important fringe? Keep scrolling to see. Alyssa Coscarelli has made this particular bob her signature style for a while now, but recently she's embraced her natural curls, and it looks even better (don't even get me started on her cuter-than-cute mini fringe). Anita recommends getting a style like this cut every six to eight weeks to keep it looking fresh, but you can get it cut every four weeks if you want to keep it looking close to perfect. Alyssa lets her hair dry naturally and then uses the below product to tease out her curls. Alyssa is a big fan of Ouai's products, and we don't blame her. She uses the Air Dry Foam to help embrace her curls. This lightweight foam is enriched with nourishing and strengthening ingredients like carrot, lemon and kale protein to help encourage your hair's natural texture and leave it bouncy yet tamed. Stylist and creative director of Le Fleur Studios Maria Bernard went straight to the top of my hair wish list when she chopped off her shoulder-length locks. Instead, she opted for—yes, you guessed it—a bob and fringe (and she hasn't looked back since). Maria's hair texture differs from Alyssa in that it looks naturally more straight and she tends to wear it that way on the daily, occasionally dabbling with a clip or two. If sleek is your thing, use the below product to maintain this look. The newly launched We Are Paradoxx has a whole host of incredible products, but it's the Climax Volume Tonic that will work best for this style. Maria likes to wear her bob super-shiny, and this blow-dry volumizing primer will give your strands a glossy, sleek smooth look in no time—all while adding volume. Sweedish cool girl and founder of brand marketing agency By Babba, Babba C Rivera has long featured in my Saved collections on Instagram—and not just because of her impeccable style. 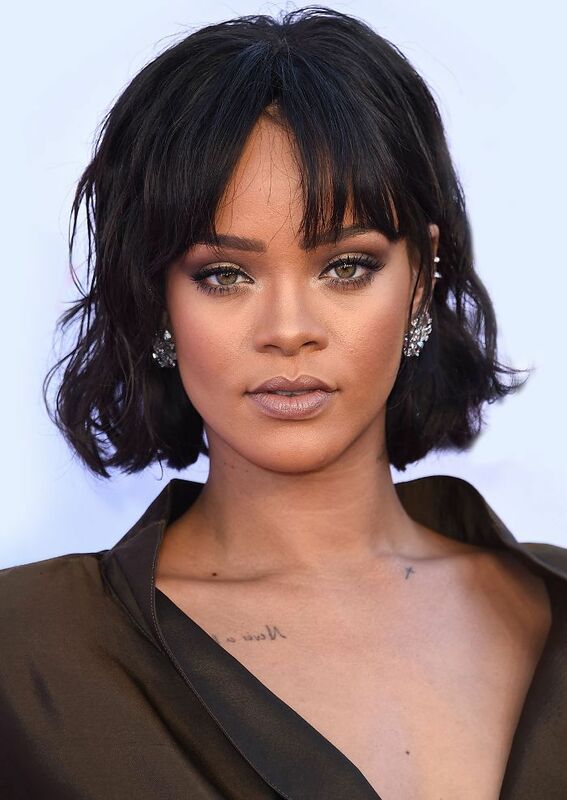 She's one of the original members of the bob-and-fringe club and nails this look time and time again. According to Into The Gloss, she's a big fan of sea salt spray to give her hair that messy bedhead texture. Shop my favourite below. Anita recommends using a sea salt spray or scrunching potion to help build texture, and this Bleach London one does exactly what it says on the tin. Simply spray Swamp Spritz in your roots and leave your hair to dry naturally. It'll make you look like you've just spent the afternoon on the Spanish coast dipping in and out of the water only to drift off to a beach-front bar with your air-dried slightly tousled hair blowing in the wind. Kat Graham is a new hair crush of mine, and it's all thanks to my editor in chief's recommendation that I can add her to my "girls with great bobs' list. The actress opts for a slightly shorter bob than my other loves but balances it out by wearing it with a slight wave rather than straight. This gives the illusion of lift and texture: two things that are vital when styling short hair. Notice her fringe is longer too (this adds to her whole messy-chic vibe). Rice tells me that the most important thing to do is to create the right regimen for your hair texture and type. If you are lacking moisture and need to create a curl in a more defined styled way, use a wand and mist. Sam McKnight's Cool Girl Barley There Mist is the perfect spray to create—as the name suggests—cool-girl texture like Kat's hair. Spritz this on dry hair and run your fingers through your roots to create lift and you're good to go. I can't write a story about this hairstyle and not include Taylor Leshae. 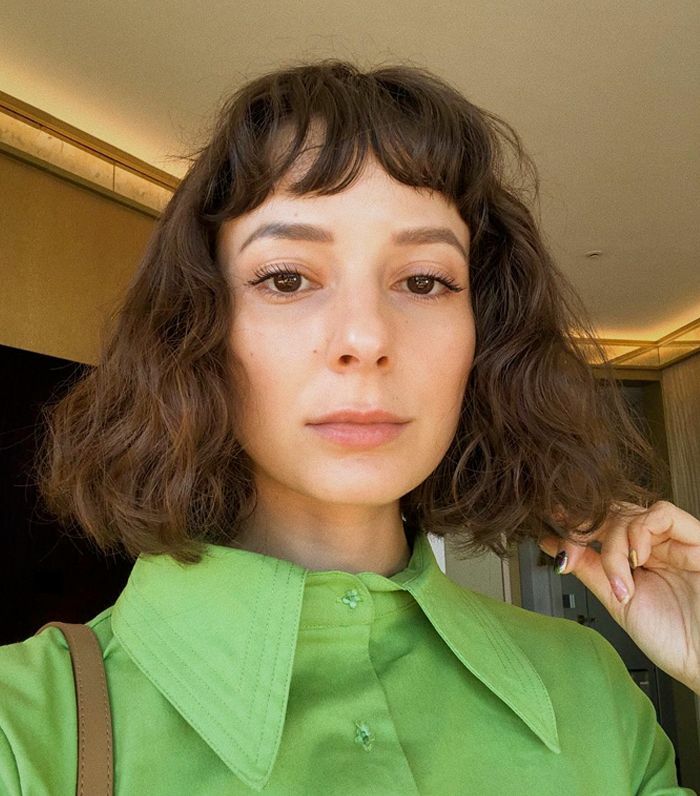 The French-Colombian actress's bob is cut shorter than most and lands just above her lips. This helps to emphasise her features and looks best when worn loose in a shaggy style. Taylor's hair looks great because of it's shine, and if you want shine, Moroccan Oil is the product for you. This light version means your hair won't feel weighted down but will still add a subtle sheen and help eliminate any frizz. Next up, this is the product Jennifer Aniston swears by for glowing skin.